Will he succeed Kamath at ICICI Bank? He is the new face in ICICI Bank's [Get Quote] top management team, but an old hat at the bank having worked there for a decade. 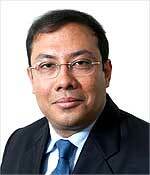 Executive director Sonjoy Chatterjee is responsible for international and corporate banking. He has worked closely with managing director and chief executive officer K V Kamath since the erstwhile development finance institution (DFI) transformed into a financial conglomerate. You recently came back to India. How would assess your journey so far? The biggest excitement is to come back to India at a time when a lot is happening in the country. What India is experiencing now happens in a century. In the last six months, I have been soaked in that excitement. You will continue to see parts of that excitement coming through in what this team is planning to achieve. For over a year or so we have been very focused on the corporate banking business. We are seeing the fruits of creating a strong syndication platform. This has helped us play a key role in the overseas merger and acquisition market. The scale of projects is very large domestically and we have a role to play in this space. Our size gives us the advantage of participating in large transactions. We also have good appraisal skills to drive large project finance portfolios. People say that there is no need to set shop across the globe to run an international business. Instead, you can use the strategic alliances route. The annualised flow of $10 billion from global retail liabilities helps the bank drive its outbound M&A business. If there was no access to this liability base, we would not have been able to run this business. Considering the scale of transactions, you need to have a strong syndication platform. We have a strong syndication desk in Singapore, Dubai, London and New York. To drive the syndication capabilities, mobilise deposits and meet the funding needs of corporate India, you have to set up your own establishment. For the remittances business, we have alliances. Currently, we are looking at mining deep into existing geographies. ICICI Bank opened a branch in Germany one month back and it already has 5,000 customers with a deposit base of around Rs 500 crore (Rs 5 billion). We have created a brand for ourselves in the UK, Germany and Canadian markets and developed the right products. We have a good sense of regulations in these markets. The UK subsidiary is a profitable option. Europe and North America drive the bank's low cost deposit business, which facilitates the global M&A financing business. In West Asia, the bank has been focusing on the private banking business and the whole non-resident Indian interface. NRIs are a key source of current and saving accounts and West Asia is the biggest source of funds globally. As a bank, we need to ensure institutional flows into India. The Hong Kong and Singapore cluster houses a strong syndication platform. The international corporate loan financing and trade finance is driven out of Singapore. In the United States, we have the permission to conduct wholesale banking business and deal with H1B Visa owners. That in itself is a huge opportunity as there are nearly 100,000 H1B visa owners. We will have to wait to go whole hog into this market and tap the local population for liabilities. How have you built a low-cost deposit base and kept the cost of global operations at a minimum? The global business has been leveraging on the strengths of ICICI Bank. The maturity of ICICI Bank's technology platform has bought down the cost of global operations. Our cost of technology is one tenth of most global banks. The cost-to-income ratio of ICICI Plc is 25 per cent compared to global banks' 50 per cent. The cost per transaction on saving accounts has been consistently going down and balance per account has been increasing. The cost advantage is on account of doing business out of India and the scale of operations. We have good processes and the customer complaints are also low. We are not a heavy advertiser and we are not among the top five players in terms of the interest rates we pay. Has the US subprime crisis hit corporate growth and funding plans in India? Corporate India is not bothered about the subprime crisis. I have not seen any large business house walk away from a deal on account of lack of funding. Yes, the cost of funding has increased as the rupee arbitrage has gone up. Large business houses have a five to six-year time horizon. Corporates are gearing up for real demand. There are two pillars to the corporate banking piece, one is the overseas acquisition and the other is project finance. None of these projects have been hit due to lack of funding. Power is very interest rate sensitive. A steep rise in the interest rates will impact projects. Are you looking at any inorganic growth opportunities globally? We will evaluate opportunities. We are doing a fair amount of India-centric business and building a low-cost deposit base. We would look at acquisitions to strengthen this business. You are seen as a possible successor to KV Kamath. . . Personally, I have an exciting job in hand. This is a significant aspect of the bank's aspirations. Frankly, that's the only thing driving me at present.